Characteristic electrocardiogram (ECG) features of posterior myocardial infarction (PMI) do not include typical ST-segment elevation and, therefore, carries the risk of delayed diagnosis and management. The aim of this study was to investigate how well PMIs are recognised and whether a lack of recognition translates to a larger infarction. This was a retrospective cohort study of patients sourced from a cardiac catheterisation database. Based on ECG analysis, patients included in this study included those meeting PMI criteria and those meeting ST-elevation myocardial infarction (STEMI) criteria as the control group. Door-to-balloon times were used as an outcome measure for differences in recognition between PMIs and other STEMIs. Troponin was used as a surrogate marker to measure degree of myocardial damage. There were 14 patients meeting PMI criteria and 162 meeting STEMI criteria. PMI patients had significantly longer door-to-balloon times. There was no statistically significant difference between PMI and STEMI group initial troponins t(169)=1.05, p=0.30, or peak 24-hour troponins t(174)=–1.73, p=0.09. In conclusion, using door-to-balloon times as a marker for recognition, this study illustrated that patients suffering PMI experience delayed recognition and management compared with non-PMI STEMIs. This did not, however, result in a significantly larger size of infarction as shown by peak troponin levels. An acute myocardial infarction causes a number of electrocardiogram (ECG) changes corresponding to coronary anatomy.1,2 The posterior myocardial infarction (PMI) refers to an infarction of the posterior wall of the left ventricle (LV).3 On the 12-lead ECG, the key to detecting a PMI is through indirect evidence via ST-depression in the antero-septal (V1–V4) leads and evolving R-waves in V1 or V2 with R/S ratios >1.1 A common theory is that these evolving R-waves represent inverted Q-waves. While ST-depression typically occurs in V1–V4, it may also extend into V5 and perhaps other leads.4 In these cases, posterior occlusion can still be the cause if the ST-depression in V1–V4 is of greater amplitude.4 Therefore, an improved detection rate would be to include ECG traces with ST-depression extending past V4, provided that this depression is relatively minimal compared with V1–V4. The aim of this study is to investigate how well PMIs are recognised, using ‘door-to-balloon times’ as an outcome measure, in patients having primary percutaneous coronary intervention (PCI) or those having elective (within 24 hours post-acute coronary syndrome [ACS]) PCI with significant occlusion. The secondary aim was to determine whether a lack of recognition translates to a larger infarction through a surrogate measure of peak troponin levels,5 compared with patients meeting ST-elevation myocardial infarction (STEMI) criteria. This study was a retrospective cohort study at a single tertiary institution and ethical approval was granted through the Wollongong Hospital (TWH) research governance officer and the University of Wollongong Human Research Ethics Committee. Over a two-year period ending December 2013, TWH catheterisation database was searched for non-ST-elevation myocardial infarction (NSTEMI) and STEMI patients. De-identified, coded data included: ECGs, basic clinical and demographic data. Demographic and clinical data included age, gender and comorbidities. The time from symptom onset until presentation, and door-to-balloon times were also recorded. Occlusion was defined as a thrombolysis in myocardial infarction (TIMI) score of 0–1.4 The treating cardiology consultant interpreted results of troponin and angiography analysis at the time of admission. Hyperkalaemia >5.5 mEq/L, tachycardia >130 bpm, pulmonary oedema with respiratory failure and diastolic blood pressure (DBP) >120 mmHg, as these commonly mimic occlusion on the ECG.4 Other exclusion criteria included patients with a pacemaker, transferred from other wards or operating theatres, post-cardiac arrest, or those with re-infarctions within one week. All statistical analyses were performed using SPSS (Version 21.0; SPSS, Inc., Chicago). Independent samples t-tests were used to compare continuous variables and Chi-square tests were used for categorical variables between PMI and non-PMI STEMI patients. Ten per cent of ECGs were chosen using a random number generator for inter-rater reliability analysis. Inter-rater reliability coefficients between JW and AL (consultant cardiologist) were calculated using Cohen’s Kappa. These ranged between 0.85 and 1.0. All tests were two sided and significance was set at the conventional p<0.05. Normality statistics were calculated using the Shapiro-Wilk statistic, as this test has been shown to have the best power for a given significance.7 Normality was present below, unless stated otherwise. Levene’s test was used to assess homogeneity of variances and if violated, t-statistics from the ‘equal variances not assumed’ row were used. During the data collection period, 1,429 patients underwent coronary angiography at TWH. Of these 28 met exclusion criteria, 375 had missing data, 807 had either no lesion or TIMI flow ≥2 on elective PCI. 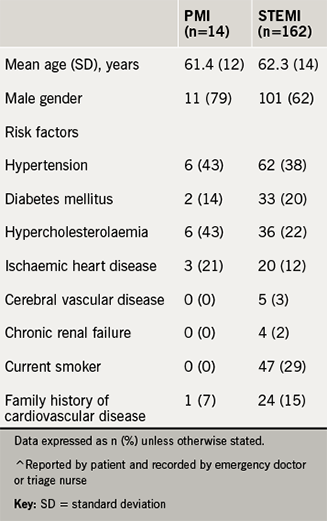 Of the remaining patients, 14 met PMI criteria and 162 met STEMI criteria. Patient demographics for PMI and STEMI groups are presented in table 1. In the 14 PMI patients, the vessels occluded involved: left circumflex (LCx) 50%, right coronary artery (RCA) 36%, and obtuse marginal (OM) 14%. There were seven patterns of ST depression seen, with the most common leads involving: V2 and V3 both 100%; V4 86%; V5 64%; V1 43%; and V6 36% (supplementary table – available in this online version, below). On comparison between PMI and STEMI patients, there was a significant trend towards longer times from onset of symptoms until presentation, door-to-balloon time (table 2) and prominent R-waves in V1 or V2, t(12)=2.40, p=0.03 (supplementary table – available below). 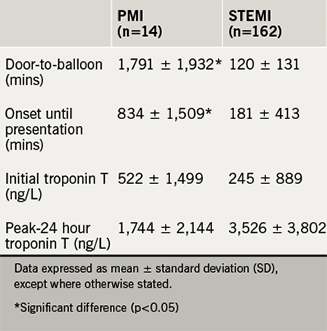 There was no statistically significant difference between PMI and STEMI group initial troponins t(169)=1.05, p=0.30, or peak 24-hour troponins t(174)=–1.73, p=0.09 (table 2). This was a single-centre, retrospective, cohort study with the aim of determining how well PMIs are recognised, using ‘door-to-balloon times’. The secondary aim was to determine whether delayed PCI translates to a larger infarction through a surrogate measure of peak troponin levels compared with patients meeting STEMI criteria. In accordance to current guidelines, there was a significantly longer door-to-balloon time in the PMI group compared with the STEMI group. A common theory is that prominent R-waves may actually represent inverted Q-waves.1,8 Interestingly, over a third of patients had prominent R-waves in either V1 or V2. Given that there was no increase in infarction size despite longer PCI wait times, our study findings support the inverted Q-wave theory. This confirms that ACS patients with PMI, especially those with prominent R-waves are unlikely to receive benefit from emergency PCI. Given that only one patient with prominent R-waves had a prior history of myocardial infarction, it is unlikely that these findings have been confounded by prior ACS. Our study found a slightly different pattern of ST-depression than that of previous studies. The present study demonstrated ST-depression to be more common in V4–V5 compared with V1. The present study used a different methodological start point. Rather than using ECG with V1–V4 ST-depression, our analysis started with patients that demonstrated a proven posterior infarction on coronary angiogram. Based on these findings it would prove wise for clinicians to consider PMI in patients presenting with ST-depression from V2–V4, with or without extension into V1 or V5. This study showed that patients with PMI are treated in accordance with current guidelines with longer door-to-balloon times than those with STEMIs. Despite the significantly longer wait times, there was no increase in infarction size. Thus, patients with ECG changes suggestive of PMI are unlikely to receive benefit from emergency PCI. Furthermore, PMI should be considered in patients presenting with ST-depression in V2–V4, with or without extension into V1 or V5. Dr Warren Rich and Associate Professor Ulrich Bommer for their assistance navigating the ethics approval process. 1. van Gorselen EO, Verheugt FW, Meursing BT, Ophuis AO. Posterior myocardial infarction: the dark side of the moon. Neth Heart J 2007;15:16. 7. Razali NM, Wah YB. Power comparisons of Shapiro-Wilk, Kolmogorov-Smirnov, Lilliefors and Anderson-Darling tests. Journal of Statistical Modeling and Analytics 2011;2:21–33. 8. Wall J, Vlok RA, Melhuish TM, White LD. Acute myocardial infarction and STEMI-equivalent patterns. International Journal of Internal Medicine Papers 2016;1:7–11. Dedicated side-branch stent: what could go wrong? PCSK9 inhibitors are expensive/used selectively. With real-world ezetimibe underprescribing ~2% of patients are eligible and 30%, "deprived of benefit and improved outcomes by lack of optimisation and/or potential use of PCSK9 inhibitors".